On your mark, get set, CREATE some of the most awe-inspiring makeup looks! Makeup has always been such a wonderful part of the world – whether it be in movies to create some of the most legendary characters such as The Hunger Games characters Katniss Everdeen and Effie Trinket or The Pirates of the Caribbean‘s Jack Sparrow or even Edward Scissorhands; or for beauty vloggers bringing out makeup looks that are perfect for every day or some red carpet glam; or makeup is also a big part in Hollywood for all of the incredible celebrities. We can name countless ways that makeup has changed the lives we live and how it is more than something we put on our faces, but something that changes the way we see things and feel things. Ever since April 2016, one award show that all makeup lovers have been at the edge of their seats waiting for made its way for the online beauty community to enjoy. Millions of talented makeup lovers submitted videos in for the NYX FACE Awards even from countries all across the globe. It’s so incredible to see how this magnificent award show unites so many people who share the passion for one terrific thing: makeup and creating art through it. After months of engaging fans and having everyone vote, the final six contestants remain after taking on such impressive and quite difficult challenges for the makeup competition. On August 20, 2016, makeup lovers were brought together at The Novo in Los Angeles, California. At the event, hundreds and hundreds of fans had a spectacular time enjoying all things beauty and were excited to see who will be awarded “Beauty Vlogger of the Year” at the event. The NYX FACE Awards was hosted by none other than YouTube sensation, the bubbly, effervescent and outstanding Kandee Johnson who did such a phenomenal job as a host. Kandee Johnson brought even more excitement at the award show and her incredible persona made her the perfect fit as a host for this event. The final six contestants were Laura Sanchez, Alexa Poletti, Brianna Fox, CosmoByHaley, Pompberry, and RawBeautyKristi. Each of the six contestants debuted their final video for the competition that focused on emotions. Each one of the contestants’ videos were truly spectacular and mesmerizing. You can see how much effort they put into creating each one of their looks, how much fantastic talent they have, and all of the emotion they put into making some of the most interesting, captivating, and inspiring videos. They all had such wonderful story lines that showed everyone the importance of embracing our emotions and using it to evoke happiness, spread positivity, and work on what we are most passionate about. Of course, choosing a winner for the competition was beyond difficult as everyone could see how much hard work and dedication they all put into creating their final videos. The judges at the award show included Ve Neill, the genius behind some of the most iconic makeup looks in movies like The Hunger Games, Pirates of the Caribbean, Beetlejuice, and more in addition to being a judge on Face Off. YouTube phenomenon, the intelligent and terrific role model Ingrid Nilsen also gave her insight as well as Editor-In-Chief of Nylon Magazine Melissa Giannini, and beauty director at Refinery 29 Megan McIntyre. Attendees were also able to get a special treat with a performance by Beyonce’s proteges Chloe and Halle who blew everyone away with their remarkable and marvelous talent. Their vocals were truly angelic and left everyone speechless. Alyssa Edwards of RuPaul’s Drag Race also had an excellent performance at the event. After a magnificent time at the event, attendees were able to get in their last minute votes. Each of the final six contestants were able to receive $15,000 for their amazing journey in the competition. The winner of this year’s NYX FACE Awards and being honored as “Beauty Vlogger of the Year” was the gorgeous Laura Sanchez! As part of winning the competition, Laura Sanchez will have the opportunity to have consultations with professional makeup artists, a year supply of NYX Cosmetics and the chance to kickstart a professional makeup artist career. All of the contestants are truly so immensely talented. The NYX FACE Awards is such a unique award show that celebrates creativity, the power of makeup, and also loving oneself and it encourages people to be confident with who they are. The NYX FACE Awards is one of most spectacular award shows and it inspires everyone to follow after their dreams and work hard at what they are most passionate about. 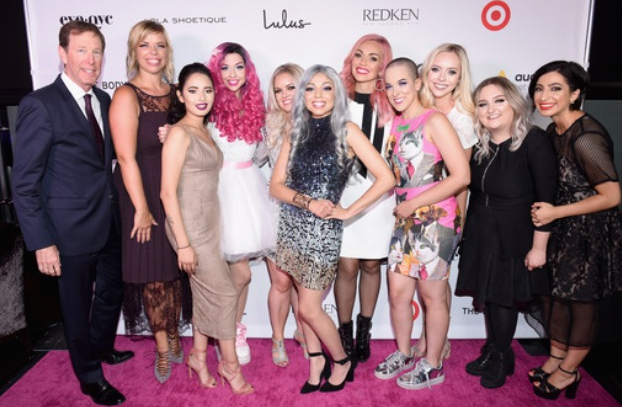 Also in attendance at the event was PatrickStarrr, CharismaStar, Adelaine Morin and more. After the event, there was an exciting after-party held. The sponsors of the event include Redken, Target, LuLu*s, Lola Shoetique, The Body Shop, Clarisonic, Eva Hair NYC and VANS. I, Alexisjoyvipaccess had the greatest honor of covering the renowned and prestigious 2016 NYX FACE Awards! Check out some VIPAccessEXCLUSIVE pictures I took from my coverage of the event and stay tuned on YouTube.com/alexisjoyvipaccess for interviews with Ingrid Nilsen, PatrickStarrr, Ve Neill, and Chloe and Halle. Here at Alexisjoyvipaccess.com, I’d like to send a big congratulations to all of the contestants and the final six for all of their hard work and to Laura Sanchez for winning the competition! Also, a big thank you to NYX Cosmetics for the outstanding gift bag! I’m so excited to up my makeup game with all of the terrific products including the awesome #LOTD Lip Of The Day (liquid lip liners) that will make everyone’s lips so luscious. I’m also thrilled to use the first base primer and the Dewy Finish long lasting setting spray to make my makeup look last for hours especially when I’m on the red carpet. The setting spray works perfectly to keep your makeup in place and it is definitely a must-have. I also love the NYX shine killer – whether it is super hot outside or if your skin is having more of an oilier day than normal, the shine killer will help you relieve all of your makeup stresses and will keep you looking top notch. My other faves are the contour duo palette as well as the fun NYX face and body glitter (you know what they say, “When in doubt, just add glitter.”) I’m totally obsessed over the color NYX liquid suede cream lipsticks that add an extra pop to your makeup look. Lastly, the NYX pore filler is something everyone should get as it is a life-saver when it comes to minimizing the appearance of pores. Thanks NYX, I am in love with your products and all of these goodies! Check out more photos from the NYX FACE Awards below! Previous VIPAccessEXCLUSIVE: Ricardo Hurtado Updated Interview With Alexisjoyvipaccess At The Say NO Bullying Festival! Next Article: Lilimar Looked So Outstanding At The Nickelodeon KCA Mexico And Accepted Bella And The Bulldogs’ Award!